Boat International Media are delighted to announce the 2019 Cultural Programme. Held on Saturday 18th May from 11:00 - 14:00, the Cultural Programme is available to guests of the World Superyacht Awards. As part of our Cultural Programme, Boat International are celebrating London and its abundance of history, heritage, arts and style, by creating bespoke experiences in the heart of Mayfair exclusive to our guests. To help you navigate your way through the cosmopolitan city of London, our tours below have been thoughtfully curated with the cooperation of all establishments to ensure a truly special experience. This is the chance to discover another side of London; something off the beaten track, behind the scenes, unusual or less well known. Join us to explore these unique opportunities and meet some of Britain’s most noteworthy names and businesses along the way. We will host tours which will include a combination of the below activities, bookings will need to be made in advance as we have limited capacity. In addition to the below tours, Stefano Ricci will be pleased to welcome guests to their London flagship store located on Mount Street in Mayfair. Please note, all tours will run at the same time, therefore guests must only book onto one tour. There is a maximum of four tickets per booking per tour. Bookings are on a first come, first serve basis. Celebrate the contemporary British art scene in the heart of Mayfair at Unit London. Be inspired during a private tour of the entire gallery and the thought-provoking work by British artist Jake Wood-Evans in his latest exhibition Legacy & Disorder. 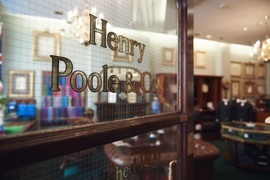 Next, move on to witness first-hand the art of bespoke tailoring at one of the most famous Savile Row houses, Henry Poole & Co. Browse through never-seen-before archives dating back as far as 1846, including two famed sailing entries of William Randolph Hearst and Sir Thomas Lipton as well as Prime Minister Winston Churchill. Discover the tailor’s secrets over a refreshing gin & tonic prepared by Savile Row Gin. Established British family perfumery Floris will be showcasing a selection of its most popular fragrances for ladies, gentlemen and the home – expect interesting stories behind these scents. To conclude, stroll through the stylish streets of Mayfair to fine wine and spirits boutique Hedonism, which has already become the most talked about wine project of recent times. Enjoy a glass from their vast collection and gain a unique insight into the production, history and expertise in every bottle. The longest serving Royal jeweller in the world, House of Garrard* opens its Mayfair home exclusively to our guests, offering the opportunity not only to browse its collections, but also to experience history first hand. Guests will be given access to the Queen Mary salon (named with Her Majesty’s permission when Garrard was commissioned to create the consort crown in 1911) and will have the rare opportunity to view and try on Royal tiara replicas. Next, join one of the famous team of Red Coats for a tour of the Fortnum & Mason building (with tastings), to hear the fascinating tales behind one of Britain’s most loved icons, ending up with – what else – a cup of Fortnum’s famous tea. The tour will conclude at the contemporary gallery Unit London, where British artist Jake Wood-Evans exhibits Legacy & Disorder; a body of work centered around the passage and experience of time and space. *Garrard has been awarded the Butterfly Mark by Positive Luxury for a company-wide commitment to sustainability. This is a bespoke single tour for guests, click the Sign Up button below for more information. Please use the arrow below to access more information on each of the venues.